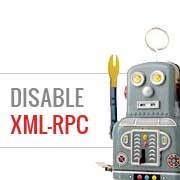 XML-RPC service was disabled by default for the longest time mainly due to security reasons. In WordPress 3.5, this is about to change. XML-RPC will be enabled by default, and the ability to turn it off from your WordPress dashboard is going away. In this article, we will show you how to disable XML-RPC in WordPress and talk further about the decision of having it enabled by default. According to Wikipedia, XML-RPC is a remote procedure call which uses XML to encode its calls and HTTP as a transport mechanism. In short, it is a system that allows you to post on your WordPress blog using popular weblog clients like Windows Live Writer. It is also needed if you are using the WordPress mobile app. It is also needed if you want to make connections to services like IFTTT. If you want to access and publish to your blog remotely, then you need XML-RPC enabled. With the increasing use of mobile, this change was imminent. However some security cautious folks may say that while the XML-RPC’s security is not that big of an issue, it still provides an additional surface for attack if a vulnerability was ever found. Thus, keeping it disabled would make more sense. To keep everyone happy, while the user interface option and the database option to turn off XML-RPC has been removed, there is a filter that you can use to turn it off if needed. Alternatively, you can just install the plugin called Disable XML-RPC. All you have to do is activate it. It does the exact same thing as the code above. While the above solution is sufficient for many, it can still be resource intensive for sites that are getting attacked. In those cases, you may want to disable all xmlrpc.php requests from the .htaccess file before the request is even passed onto WordPress. Because we do not use any mobile app or remote connections to publish on WPBeginner, we will be disabling XML-RPC by default. What are your thoughts on the issue? hi, is it on the .htaccess file on the website root that i will paste the code? why would we allow 123.123.123.123 ? If we aren’t using the service at all, why not let “deny all” be absolute? I gather that if you have a fixed IP address you could change order to “allow,deny” and replace 123.123.123.123 with your IP address. That would allow your IP then deny all others. Me an my .htaccess are going to have a little chat about htpasswrd and this here XMLRPC thingy my clients will never need. You all just made my corner of the net a little bit safer, as MailChimp would say: High Fives! Ok, i will use this code but i want IFTTT to have work on my website what i need to add? I have followed the instructions to block the xmlrpc.php file using .htaccess but im not sure if it is working. I can still see the requests coming in, but the code at the end has changed from 500 to 403. Im concerned im getting a false report from my WordFence plugin and that im still being flooded with spam. Can anyone advise? Oh yeah! Thats working perfectly, your XMLRPC is FORBIDDEN! HTTP Status Code 403: The server understood the request but refuses to authorize it. I’m using my wordpress blogs with IFTTT and all worked fine, until I integrated it with MaxCDN; IFTTT immediately stopped working. I did some research and the problem might be related to XML-RPC that was de-activated. When I check my dashbord in “Settings” > “Writing” , I don’t see anything like XML-RPC, Remote Publishing, etc. I’ve checked database in options, also xml-rpc not available / missing. I need to activate XML-RPC to keep my IFTTT working. How do I re-activate XML-RPC; all I need is a script that I can add in .htaccess or functions.php to activate XML-RPC. And why am I missing the XML-RPC funtionality in my dashboard. Connect to your WordPress site using FTP client or File Manager in cPanel. In your website’s root directory look for xmlrpc.php file. If it is there, then try step 2. If it isn’t then download a fresh copy of WordPress. Unzip and extract it and upload xmlrpc.php file back to your site’s root directory. Step 2: Check your WordPress theme’s functions file for the code that disables XML-RPC. Step 3: Check your .htaccess and wp-config files. Please,what can i do to enable xmlrpc on my site?because i can’t login using wordpess mobile app on my smartphone.. If you are using a security plugin on your WordPress site, then check its settings. Booyah! This WP filter fixed the script kiddie attack. I still firewalled the person, but I don’t have to watch the logs like a hawk to add more IPs to the firewall. THANK YOU. That’s why we use Sucuri. Is that because Sucuri acts like the Disable XMLRPC plugin? Sucuri acts like a firewall between your site and users. It blocks any suspicious activity before it could reach your website. I’m totally onboard for disabling xmlrpc.php server wide in my /etc/httpd/conf/includes/pre_main_global.conf file. But I am left with this questions…is there a way to determine that a particular plugin “NEEDS” xmlrpc.php in order to work? I have concerns with blocking access to it and then having an issue 2 months down the road and not know that the issue is with the fact that I blocked xmlrpc.php previously. Are there any common signs to look for in a log file or such which would point to a xmlrpc.php block as the cause? Hey am using WordPress app to post with my android smartphone. Now I can’t login and my login credentials are correct. The response I got was ” we can’t log you in couldn’t connect to the WordPress site”.Could you help me fix this WordPress app login error. If it is there, then you need to remove it. You can also try deactivating plugins and turning them on one by one until you find the plugin that is stopping you from login using WordPress mobile app. It’s worth noting, that “allow from 123.123.123.123” is optional, and if used should be updated to include your IP, or the IP of the device that needs access to xmlrpc.php (it would be good to cite examples in this article). I am using GoodbyeCaptcha plugin to turn off the XML-RPC and works with no problem while Jetpack is activated. Sorry, I’ve tried this method many times. It didn’t work for me – in fact it brought the front end down (blocking visitors read access to the web page) after adding these codes to the .htaccess file. Does disabling it this way prevent this issue? http://theaffluentblogger.com/operating-a-website/wordpress-xmlrpc-php-vulnerability-affects-shared-hosting-sites/ I have a friend whose site is continually crashing because of her xmlrpc file being attacked. Yes it will prevent the attack to an extent. Keith, there’s a trend in WordPress to move non-theme related functions out of the functions.php file and into a “site specific plugin”, basically a plugin that you only activate on one unique website and it stores the non-theme related functions for that site. You can accomplish the same thing by placing the code in your functions.php file. Looks like you guys have already covered it. BTW – what’s happened to your comments system? Was Livefyre then something related to twitter and facebook and now ? Which plugins are site specific?